We needed five lamps to light the lounge of our newly refurbished home in Toulouse, France — an old house, with red brick walls, similar to many homes in the region. I began my first experience in lamps with this project. I wanted a three-faced lamp with a continuous design across all sides. I first designed a pattern similar to whitewaters. The base of the lamp would be in plywood, which can be easily tailored. The main issue was to design the lamp so that the two lateral faces flared, which implied bending the lower part of the lateral faces. I was afraid of breaking the design when bending the sides, but I found that this step was easy and at no risk to the panels. The whole design (glass and wood parts) was made with Glass Eye 2000. I have had the Professional Plus Edition for many years. Early on I tried using other software for stained glass design, but when I found Glass Eye 2000 I knew it had all the functions I required. I also use it for projects in wood or metal. Many functions allow reaching results quickly, especially all the symmetry functions, subdivide and curves. Also, Glass Eye 2000 is very precise and my printouts are exactly what I've specified. 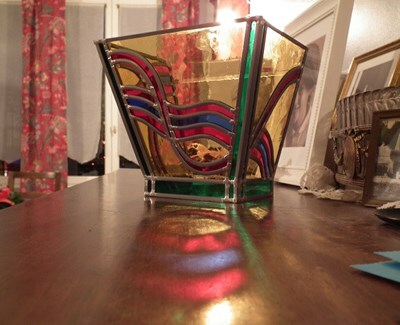 The glass part of the lamp is traditionally made with lead came. Some of the glass pieces are small and thus delicate, so be careful when assembling the panel. Use U-lead came for the border of each panel for a clean finish. When all three faces are ready, bend them carefully (and slowly) to obtain the desired angle, then solder the three faces. To have a better rigidity, I use two strips of transparent glass on the back, soldered on each lateral face using copper ribbon. As they are transparent, these strips are not visible when the lamp is finished. The upper strip allows fixing the glass part on the wood box using a little hook. The wood box is quite simple to realize with traditional tools. Paint and sand all the faces (several times) for a smooth surface. I painted the upper back face the same color as the wall so that the glass part of the lamp seems to have no support. All the faces can be fixed with wood glue. I used a GU10 bulb, but it is possible to adjust the hole for the bulb in case you use another type. 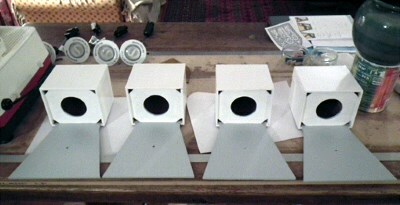 If the bulb feels too hot, make some holes around it; I made them on the corners of the bulb mount. After the final assembly, enjoy the result! At night the light produces colored reflections on the wall and provides smooth, relaxing and delicate lighting. François lives in Toulouse, in the south of France, where there are many examples of stained glass panels in churches. There he finds inspiration for his designs. He's been doing stained glass since 1999, after attending two training courses on stained glass and glass painting. 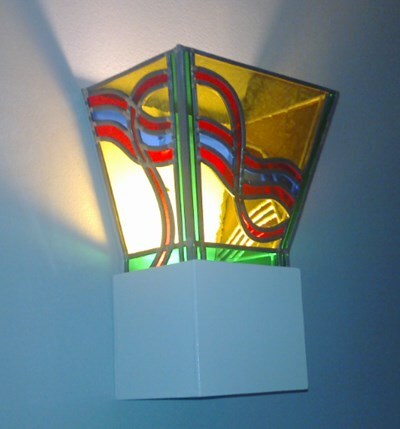 He enjoys making his own designs, and also restoring old glass panels coming mainly from churches. François can be reached by email to discuss glass panels or for any details on the whitewater lamp.